I've long toyed with the idea of converting an inkjet printer from ink cartridges to an aftermarket ink tank system. Ink tank systems replace ink cartridges with external ink tanks allowing you to print thousands of sheets at a time. When ink runs low you refill the tanks from cost-effective ink bottles instead of replacing cartridges (expensive!) or refilling cartridges using a needle-based system. Ink tank conversion kits are also relatively inexpensive -- typically running $50 to $100 -- and pre-converted printers are available for a small premium. I may have no further need to consider ink tank conversion kits. HP just released information on two upcoming consumer-level ink tank-based printers. The news has not been officially announced in the US just yet (you read it here first!) but the printers are now listed on some HP websites. The two initial DeskJet ink tank models are the GT 5810 and GT 5820. Based on early overseas reports, I think we can expect these two models to sell in the US between $150 to $200 and individual ink refill bottles to sell between $5 to $10 per bottle (5,000 to 8,000 sheet yield per bottle). 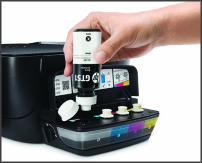 These new printer models' apparent ink tank capacities do not measure up to some aftermarket conversion kits but it's a promising start from HP.